A car bomb exploded Monday near coalition headquarters, killing four people and wounding 25 in violence that U.S. authorities believe was aimed at blocking the coming transfer of power. Four American soldiers were reported killed in other attacks. Monday's blast took place in Baghdad's Harithiyah district, about a half-mile from where the head of the Iraqi Governing Council, Izzadine Saleem, was assassinated in a May 17 car bombing. U.S. soldiers pushed back screaming crowds as ambulances raced to tend to the wounded. U.S. officers said no prominent political figures were in the area at the time and they were uncertain of the target. It also was unclear whether it was a suicide attack. However, the dead did include Sabiha Aref, 72, the sister of former Iraqi presidents Abdel-Salam Aref and Abdel-Rahman Aref, who served as head of state in succession between 1963 and 1968. She was killed by flying glass while cooking lunch at home, a relative said on condition he not be named. Four American soldiers died over the weekend in separate attacks, including two killed during fighting in the Shiite holy city of Kufa. A five-day Shiite-negotiated truce between the Americans and radical cleric Muqtada al-Sadr's militia appeared to be unraveling. Hoping to save the cease-fire, Governing Council member Ahmad Chalabi and other Shiite leaders met with al-Sadr representatives and declared there was "a momentum for peace." A dispute between Iraq's Governing Council and U.S. occupation authorities over the selection of a new Iraqi president threatened to delay the appointment of a new government to take power June 30, Iraqi officials said. Attackers in Samarra, 75 miles northeast of the capital, Baghdad, hurled three mortar shells into a market, killing three and injuring four, said Rashid Abdullah, a hospital official. American troops in Iraq died in May at a rate of more than two per day, pushing the combined death count for April and May beyond 200, according to Pentagon figures. Despite war and occupation, Iraq has seen a surge in human rights organizations, political parties and independent newspapers — entities almost unheard of under Saddam Hussein, said a report by an Arab think tank. The White House confirmed Sunday that President Bush has mounted a trophy of the Iraq war in a study next to the Oval Office: Saddam Hussein's pistol. Saddam had the gun when he was captured, and U.S. soldiers who found him presented it to Mr. Bush, CBS News Senior White House Correspondent John Roberts reports. Four American soldiers died over the weekend in separate attacks, including two killed during fighting in the Shiite holy city of Kufa, where a five-day Shiite-negotiated truce between the Americans and radical cleric Muqtada al-Sadr's militia appeared to be unraveling. Hoping to save the cease-fire, Governing Council member Ahmad Chalabi and other Shiite leaders met with al-Sadr representatives and declared there was "a momentum for peace." Shiite leaders said Americans should end their "aggressive patrolling" and stay away from holy sites in Najaf and Kufa, Najaf Gov. Adnan al-Zurufi said. In exchange, those militiamen not from Najaf and Kufa would go home while others would keep off the streets. "The preliminary agreement is already there," al-Zurufi said. "We're waiting for an official response from the high command." While the Americans consider the proposal, al-Sadr's fighters will reduce their visibility in Najaf and Kufa for the next 48 hours, said Ali al-Jhoriafi, an official close to the talks. The Shiite leaders also hope the Americans will cut back on patrols during the same period. Coalition spokesman Dan Senor characterized the talks as a step forward even if no deal is reached. Shiite politicians are trying to end the 2-month-old standoff in the cities 160 kilometers (100 miles) south of Baghdad and restore government control there. Troubles emerged in the cities after occupation authorities cracked down on al-Sadr's militia in April, closing his newspaper and announcing an arrest warrant against him for the killing of a rival cleric. Al-Sadr's supporters took to the streets, vowing to protect him. Under a deal announced Thursday with Shiite leaders, al-Sadr agreed to send his fighters home and negotiate the future of his militia and the arrest warrant with other religious leaders. U.S. troops agreed to halt offensive operations around Najaf and Kufa. However, the Americans say there has been little sign that al-Sadr has complied with the agreement, and the continuing clashes have intensified in the following days. Militiamen accused American troops of provoking the latest clash, which began Sunday night and persisted until early Monday. Al-Sadr's followers said the Americans fired near the city's main mosque. But Brig. Gen. Mark Kimmitt, coalition deputy operations chief, denied that "offensive operations" were under way and said the Americans fired in self-defense. At least one Iraqi was killed and eight were wounded, hospital officials said. It was unclear whether they were civilians because al-Sadr's militiamen often do not take casualties to government hospitals for fear of arrest. Meanwhile, two other U.S. soldiers died in separate incidents over the weekend. A Task Force 1st Armored Division soldier died Sunday and two others were wounded when a roadside bomb exploded south of Baghdad, the military reported. A Stryker Brigade soldier also died from wounds following a mortar attack Saturday in the northern city of Mosul. The military also honored its war dead in Memorial Day ceremonies across Iraq. "When we return to our home stations, we must ensure that we never forget those fallen comrades that deployed with us that will not return to their loved ones," Lt. Gen. Ricardo Sanchez, the senior U.S. military officer here, said at Baghdad's Camp Victory. "We must not walk away from this mission." 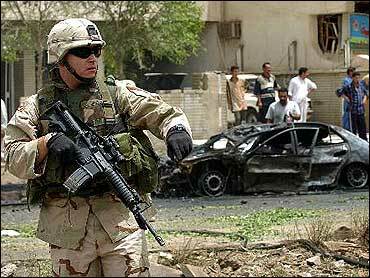 More than 800 American service members have died since U.S. President George W. Bush launched the Iraq war in March 2003. Most of those deaths occurred after Bush declared an end to major combat on May 1, 2003.